eMaxAction.com offers the following Nitto Kohki Atra Ace Drills, Selfer Ace Punches, Pumps and Parts for online purchase and free STANDARD delivery. On-line Video product demonstration available, click here for video listings. For Nitto Kohki Product Warranty Policy, click here. In October 1956, Toshio Mikiya (current director-chairman) succeeded in developing an Air Micrometer, which measures sizes in units of 0.1 microns, and founded Nitto Kohki to manufacture and market this invention. The company also developed -- as a jig for connecting fluid lines -- high-performance fluid couplings, which were marketed under the "CUPLA" brand name as quick-connecting devices. This was the genesis of the high-performance couplings that are now known worldwide under the "CUPLA" brand name. Since that time, the company has commercialized some 25,000 different types of products. 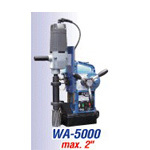 Recognizing a potentially massive demand for a portable drill press, Mr. Mikiya next developed the "ATRA" portable drill press, which incorporates an electromagnet (Atra Ace) . This product, continuously updated and improved over the years, still ranks as one of our most popular products. Our founder was committed to the goal of producing "energy- and- labor-saving" technology, by developing industrial tools that could be operated with equal ease by both absolute beginners and experienced workers. At that time, Japan had an abundant workforce and factories could easily find skilled workers for any operation. However, Toshio Mikiya had a sense of mission that Japan should move beyond depending solely on personal skills that called for long experience. He believed that, with continued reliance on such skills, Japanese industry would never be able to catch up with its Western counterparts. At the same time, he foresaw that someday Japan would face a situation of high wages and labor shortages. These convictions gave birth to his goal. Today, Mr. Mikiya's predictions have become reality. We have been in an era of worldwide labor saving. Armed with core technologies in fluid engineering and mechanical engineering, Nitto Kohki continues to develop new products that correspond to market demands. We are currently introducing a number of unique products in such diverse fields as quick-connecting fluid couplings, machines and tools, linear pumps, door closers, and many more. From the beginning, Nitto Kohki has based its operations on the enduring slogan:"Save energy and labor in industry and improve the working environment", and has been committed to producing highly functional, high-quality, reliable products using the group's unique technology. These activities have been guided by the corporate motto, that "Development provides corporate insurance". In 2006, the company will observe a significant milestone: its 50th anniversary. In March 2000, Nitto Kohki succeeded in becoming listed in the First Section of the Tokyo Stock Exchange Market. At the same time, Nitto Kohki will continue to contribute to society through the group's business activities. "Technology" refers to professional expertise and skills. "Vitality" denotes the mental and physical capability of energetic workers to act. "People's confidence" infers the ability to win public trust. Accumulating an ideal balance of "expertise", "vitality" and "people's confidence" will contribute to employee character building, and ultimately result in strong corporate development. Nitto Kohki develops, manufactures, and sells useful and valuable products in an effort to contribute to society on a broad basis. Nitto Kohki is committed to enhancing the wellbeing of employees and their families through enlightened management policies and practices. Nitto Kohki pursues appropriate corporate profitability, and aims at ongoing business development in order to realize a "contribution to society" and "the wellbeing of our people".